If you've got a family — especially one with young kids — then you know putting together healthy meals every night can take more planning and preparation than you have time and energy. NEW YORK (AP) — If you've got a family — especially one with young kids — then you know putting together healthy meals every night can take more planning and preparation than you have time and energy. Could a subscription service that delivers kits of pre-measured ingredients and recipes be a cost-effective and healthy solution? To find out, I spent a month cooking meals created by some of the biggest players in the industry: Blue Apron, Plated, Purple Carrot, Hello Fresh and Marley Spoon. Their taste, value and customer service varied. And ultimately the question of whether these kits might work for you depends a lot on whether you're a picky eater and how much you value time. Each of my boxes contained three dinners for two. My husband and I tested out the services, since my kids typically eat well before he gets home anyway. Here's what I found. You can find mini reviews of all four services at http://apne.ws/1oTaYIJ. At about $10 per meal, per person, the services cost more than groceries, but probably less than takeout or a restaurant meal, depending on where you live. I didn't save money. The meal kits don't yield leftovers, so that meant buying groceries for sack lunches or picking up takeout. Factoring out the substantial first-week discounts the companies all offer, my family's weekly food budget grew by roughly 60 percent to cover the additional costs. Yes, though not in the kitchen. I'm no slouch at the stove, but all the meals I made still took longer to prepare than the kit recipes said. I did, though, save time on grocery trips. And the boxes minimized what I needed to pick up and schlep back on the shopping excursions I couldn't avoid. Another time-saver: You don't really have to decide what you're having that night until just before dinner time. (Though you should probably make seafood dishes sooner rather than later.) And you can try out new dishes and flavors without having to make the trek to a specialty food store. Not having to lug bags home on the subway, then drag them up a few flights of stairs, was also enticing. Suburbanites with SUVs may not feel the same way. Knowing that everything you need to make dinner is waiting for you at home is a stress reducer, but the boxes aren't foolproof. A rock-hard avocado in a Hello Fresh shrimp recipe resulted in a last minute trip to the store for a replacement. It depends. All the companies provide calorie counts; most of the meals come in between 500 and 700 calories. After that, it can get a little hazy. In particular, Blue Apron fudges the numbers, labeling some of its meals for two as actually serving three. A dinner of Italian beef sandwiches with cheese sauce and potato wedges was listed at 590 calories per serving. The kit made two sandwiches, but said it served three people. My husband and I polished off the whole thing by ourselves, consuming a whopping 885 calories each in the process. Blue Apron said the extra portion was a result of large rolls that a supplier provided for the dish, adding that the majority of its meals do serve two people. Some of the ingredients left a bit to be desired as well. While Plated boasted wild Pacific salmon, and Blue Apron supplied shrimp from the Gulf of Mexico, Hello Fresh's shrimp came all the way from India. Marley Spoon takes its focus on ingredients a step further by including products from high-end suppliers familiar to foodies. But others included mystery ingredients. 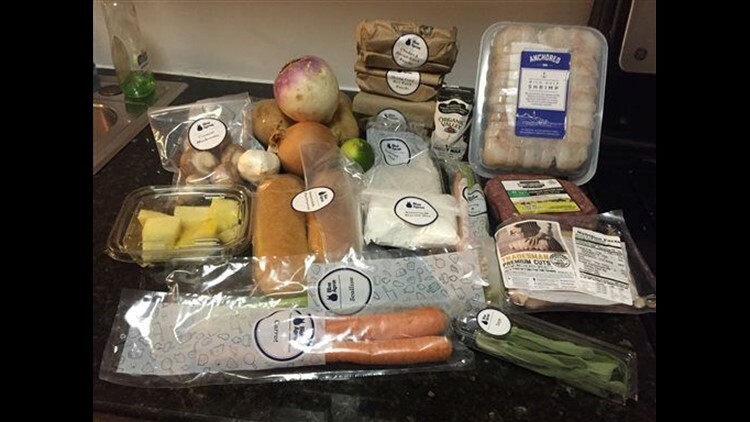 A Blue Apron kit came with a container of "chicken demi-glace" and a bag of "biscuit mix," but didn't list any ingredients on the containers or on the company's website. Blue Apron said it provides customers with ingredient lists on request, but doesn't list them on its website, because they can vary by region. Plated's fancy salmon dish included hoisin sauce, but didn't say what was in it. A Hello Fresh dish also used hoisin sauce, but it came in little takeout packets with the ingredients printed on them. It included artificial food coloring, something I try to avoid. Healthiness aside, some meals were really great, while others reminded me of the hot lunches I ate in elementary school. Meals from Purple Carrot, which are exclusively vegan, may or may not be up your alley. Some were great, all were time consuming and, unlike with the other companies, there wasn't an option to choose dishes from a list. You're stuck with the three dishes Purple Carrot schedules for a given week. It's worth noting that all the other companies offer plenty of vegetarian options. And Hello Fresh offers a vegetarian subscription that's a little cheaper than their regular one. I found the Blue Apron dishes I tried a bit simplistic and bland, prompting memories of lunch ladies in hair nets. Plated gives you the option of paying a little extra for more upscale food. A wild Pacific salmon dish was worth the extra $12 I paid on top of the company's regular $72 weekly price. But with its high-end ingredients, Marley Spoon offers much of the same quality for a fraction of the price. Hello Fresh fell somewhere in the middle. Its dishes were the fastest to prepare and tastier than Blue Apron's, though not as fancy as those from Plated or Marley Spoon. These services are worth a try. All of the companies I tried offer generous first-week promotions. But if you think you might drop them after that, go online and skip your next few deliveries while you make up your mind. Cancellations take time to process and people have gotten stuck paying for boxes they didn't want because they didn't cancel them fast enough. Whether something like this could be worth it boils down to what your time is worth. Cutting back on last-minute grocery trips is nice, but is it worth $60 to $72 a week? I grew tired of eating out of a box after a couple of weeks and began longing for fresh bread and my favorite turkey chili — not to mention "Free Wine Wednesday" at my neighborhood Thai restaurant. While I'm keeping my Plated and Marley Spoon subscriptions active, I think it's back to the grocery store for me. Though that could change after I start hauling bags up the stairs again.